NEW!! 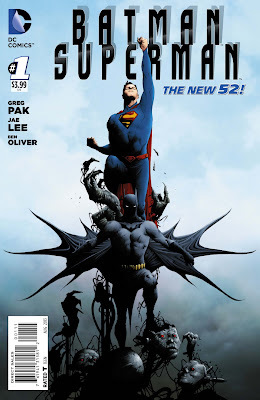 Batman/Superman #1 - "My dad always warned me about Gotham City..."
The first issue of a brand new series set in the past of the New 52, Batman/Superman #1 explores the very first meeting of both Bruce Wayne and Clark Kent and of Batman and Superman! It may not be their very FIRST first meeting ever (even in the New 52, they didn't seem to know each other in Justice League #1) but it's a well written and beautifully drawn new version of it! 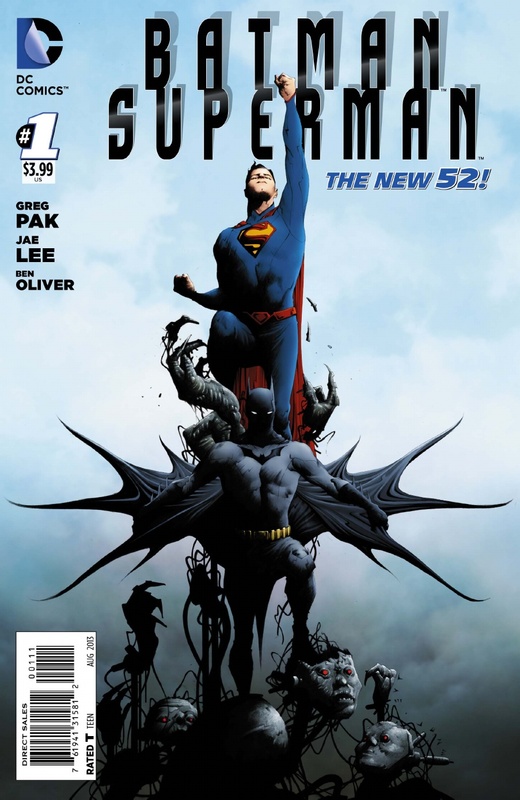 Story by the highly acclaimed Greg Pak and art by two excellent artists, Jae Lee and Ben Oliver! Jae Lee is a very stylized and atypical comic book artist, but one whose drawings are amazingly well done! His Batman and Superman are awesome to look at, and his Catwoman is quite cool too! Ben Oliver, while less experimental, is also an excellent artist and the switch between the two styles makes sense, story-wise (there may be some dimension hopping involved). Oh, and the story is intriguing too...I can't wait to see what happens next! Good characterization and some very cool establishing moments. Well Done! Of course lots of other comics were out this week. We'll look at another 4 after the JUMP! The Flash #21 - "I can't believe this kid actually thinks he can outrun me." 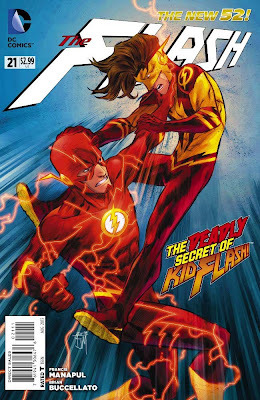 It's the first meeting between the Flash and Kid Flash! Who is this strange kid who took Barry's name without asking? Why does he decide to run as soon as Flash tries to make contact? And what possible connection could he have to the mysterious "Speed Force" killer that's already killed three of Barry's friends and who appears to wear a backwards Flash symbol? One almost identical to the symbol being worn by Kid Flash?? 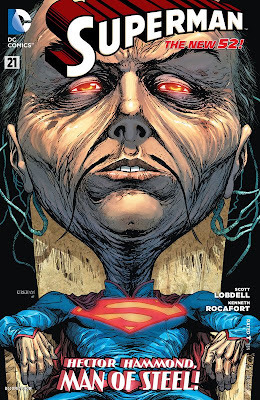 Superman #21 - "Now bring me the mind of Hector Hammond. We have a world to save...from itself." Queen Bee and her band of mindless drones known as the H.I.V.E. are active in Metropolis and looking for giant-headed psychic Hector Hammond in their quest to relieve all of us poor humans from the overbearing burden of free-will and independence! I guess his giant crazy brain will allow them to broadcast their mind-controlling signal planet-wide with ease! Since this is in Metropolis, of course Superman kind of HAS to deal with it. Problem is, as mighty as the Man of Steel may be, he's not really equipped to deal with psionic attacks all that well. Particularly since Hector Hammond (who has been in a coma-like dream state throughout the last several issues) may be about to wake up!! What a wacky issue! Occasionally I hear complaints about Scott Lobdell's super-crazy, over-the-top plots, but I love them...we'd all miss them if they were gone, right? Where else can we get wacky stories like these?? 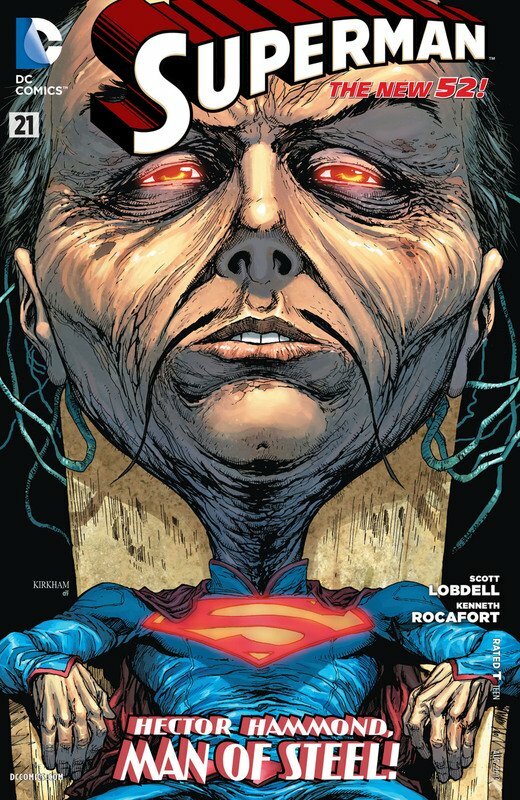 Add in the triumphant return of Ken Rocafort on pencils and it's a great month for our favourite Kryptonian! Great job!! Aquaman #21 - "This is my birthright. This is my responsibility. And I will embrace it." Poor Aquaman....the surface world either mocks him or fears him...the underwater world of Atlantis doesn't trust him...He's seperated from his queen, Mera...and he's trying to somehow be the KING. It's tough but he's a determined dude. If he can get the top echelon of his government to stop plotting against him, he may even be a kind and just ruler! On the other hand, the icy, undead First King of Atlantis is quickly approaching the underwater city and if Arthur can't get all this infighting and conspiracy under control, it'll be pretty easy for the First King to just...seize control! Wow great issue! Kudos to Geoff Johns...as always, he's writing some intriguing and complicated stuff! I really have no idea what's going to happen next! 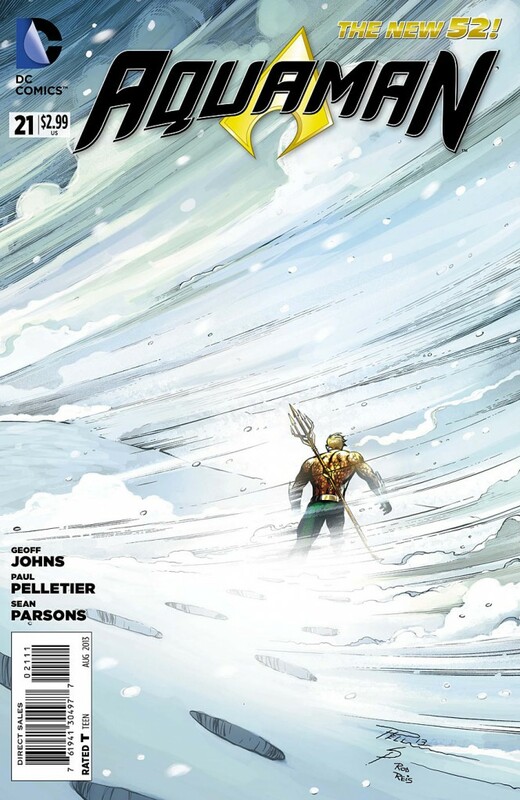 Justice League #21 - "Give me your magic now, Billy Batson...or I will destroy everything and everyone." This whole issue of Justice League is dedicated to the EPIC finale of the SHAZAM! story that's been the back-up for the series' whole run! Black Adam has learned Shazam's identity and the identities of his foster family and he's unleashed the Seven Deadly Sins of Man, who have found their human host! He wants Shazam to turn over all of the magic to him or his new "family" will burn in the agony of his mystic lightning! Billy's only hope is to solve the Wizard's riddle and unlock the secret spell...if he can figure it out in time! 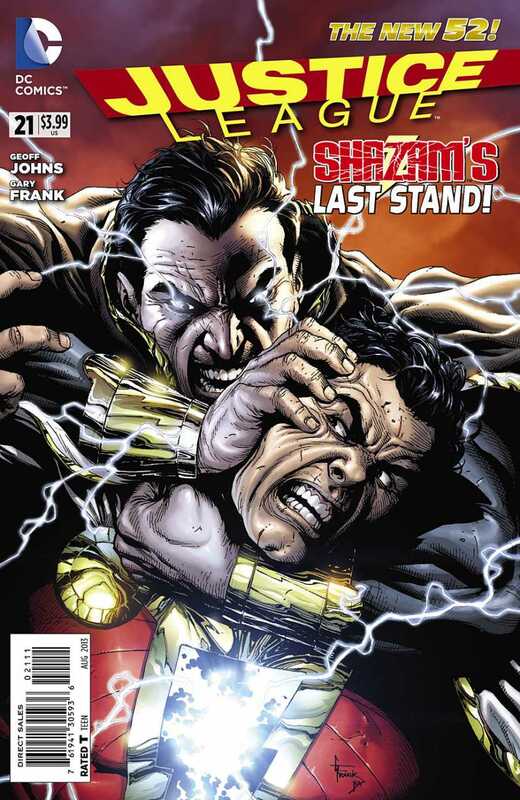 Can Black Adam be stopped? By a bunch of orphan kids and a reluctant hero? What if there were a tiger??? Cool issue...Shazam's never been my favourite character but once again Geoff Johns manages to keep me interested anyway! Here I was worried that upon retiring from writing Green Lantern he might not be busy enough! Gary Frank turns in some really great artwork this issue too! Nice! And that's it for me this week! I would have liked to also mention the really excellent issues of Justice League of America, Teen Titans and Talon that also came out last Wednesday but there was just a LOT of competition for the week! Speaking of, don't forget to visit your Local Comic Shop this week for new issues of Batman, Incorporated, Green Arrow, Detective Comics, Action Comics, Green Lantern, Earth 2...the list goes on! So many comics, so little time! Wow that's it! Can you believe it's July already?? Halfway through the year....have a great week! Peace and love and puppy dog's tales....bye!